Hi! How are you today? It’s a bit wet here this morning, but will be another warm day – so I’ll take it! Today I have a card using stamps from the Jar of Haunts set – but don’t be scared – there is no haunting here! 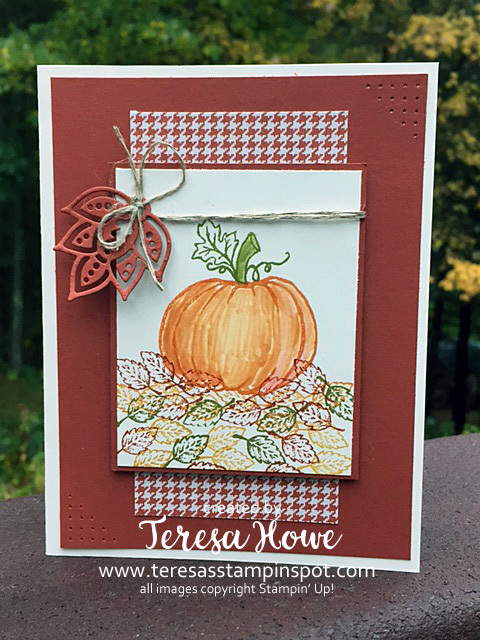 I used the pumpkin and stem images from the set to make this cute fall card. These were colored using a blender pen – my attempt at shading I think came out pretty well. The leaves at the bottom are from the Lovely as a Tree set. The layout from the card is this week’s Global Design Project challenge – #GDP058 To add interest to the card, I used my paper piercer to create a design in opposite corners. I also tied linen thread around my main panel and added the leaf from the Paisley framelits. The Designer Series Paper is once again from the Petals & Paisley Designer Series Paper pack. What are you crafting these days? I also wanted to congratulate Mary Blocher – our winner from the Team Stamp It! September Blog hop! The pumpkin appears very artistically hand drawn and painted! Is it? Awesome! Thanks for the compliment! The pumpkin is a stamp from the Jar of Haunts set – stamped in Pumpkin Pie – then colored using a blender pen – ink from the lid of the ink pad is picked up with a blender pen and then applied to the pumpkin. Gorgeous Teresa, thanks for joining the Global Design Project sketch challenge this week, best of luck!